Once your child begins to learn the letter sounds they can start on these worksheets. The first 8 worksheets are for practicing the “sounding out” technique. Please view the videos below to see “sounding out” in action. 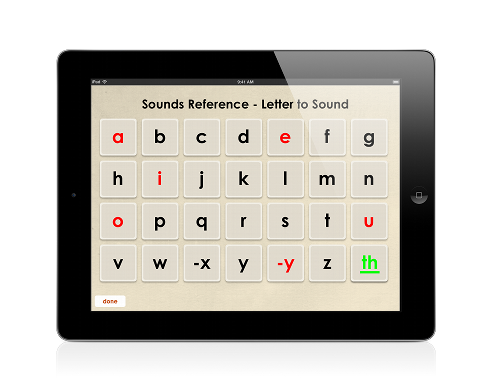 If your child does not know all the letter sounds then they can “tap them out” on app screen 10, “Phonics Touch Pad”. Through frequent practice, many students will learn the words by sight, but the aim of these worksheets is to practise sounding out. Double letters can be treated as one letter. For example, “egg” is broken in two sounds /e/ and /g/. The ‘th’ combination is one sound. For example, “this” is 3 sounds, /th/ /i/ /s/. The word “sunny” is broken into 4 sounds. The student can tap this out on the Phonics Touch Pad with the letters ‘s’, ‘u’, ‘n’, ‘-y’. The letter ‘y’ makes the /ee/ sound. Talk about the meaning of words the student is not familiar with. Use them in a sentence so the student can hear them in context. If the student finds these worksheets difficult then only do 10 words at a time. Lesson length should be appropriate for the student’s attention span. See video demonstration of "sounding out" exercises in American, New Zealand and Australian accents. Handwriting exercises. All words and sentences can be copied by the student in their own handwriting. Handwriting styles differ significantly in the English speaking world and it is worth checking with your local school what style they use before teaching your child to write. Although there are many letter writing iPad apps, we prefer that a student is taught with a pen and paper. Lower case letters should be taught first. Students can draw a picture to match a sentence. Not all sentences are suitable for this exercise. Worksheets 1 to 8 can be used as a spelling list. Say the word and then have the student break up the word into individual sounds and then write the letters. For CVC (consonant, vowel, consonant) words, most students find the beginning and end sounds the easiest to work out. Middle sounds are difficult and most students will need help. Worksheets can be printed and cut out as paper cards. Once the students can sound out CCVC words, they can start on these simple sentences containing at least one CCVC word. Read the sentence fluently after the student has read it, and make sure the student understands the sentence. Fill in the missing letters – words with consonant blends and digraphs. Sentence writing practise. Colour illustrated worksheets.